(Includes excerpts from The Guardian) How proud the Bluefield family of schools must be of the talented budding actors and singers who produced a great re-creation of the popular movie/play Footloose at the Bluefield School this past weekend. It’s hard to believe that the performers had the time to practise this show to such perfection. It reveals a lot of natural talent and great leadership and directing. By all accounts, the performance on Friday, Saturday and Sunday was everything that Sally Cole promised in her article in the Guardian on April 20, 2012. Excerpts from that article follow. “When co-director Ryan Brehaut and members of the Bluefield High School production team were looking for a musical to mount this spring, the answer was obvious.“The new movie Footloose had just come out and everybody liked it. It was a natural choice … and good timing,” says Brehaut, for the high-energy musical held at Bluefield High School April 20-22. 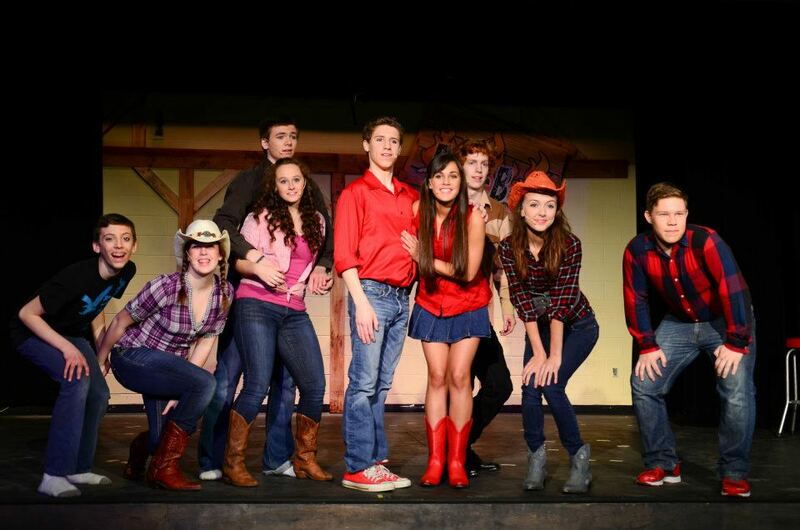 Footloose is the tale of Ren (Brandon Banks) and his mother, who move from Chicago to a small farming town. Ren is prepared for the adjustment period at his new high school, but what he isn’t prepared for are the rigorous local laws, including a ban on dancing instituted by the local preacher determined to exercise the control over the town’s youth that he cannot command in his own home. When the reverend’s rebellious daughter, Ariel(Megan McCabe), sets her sights on Ren, her roughneck boyfriend tries to sabotage Ren’s reputation, with many of the locals eager to believe the worst about the new kid.For Megan McCabe, stepping into the role of Ariel was a major adjustment. “It was a lot of work I wasn’t expecting,” says Megan, who faithfully attended each and every vocal practice. For Brandon Banks, who plays Ren, the biggest challenge was hitting some of the high notes. “It’s fun. Ren is a jokester, like me,” says Brandon Banks, the Grade 12 student who has performed in professional productions including Anne & Gilbert – The Musical and Oliver Twist. Brandon is pleased with the effort that all members of the cast, crew, ensemble and pit orchestra have put into the production. There was a magic about the entire cast and show at Bluefield High School. For this Clyde River website, Pierce Smith is singled out. Pierce is an extremely talented young man who’s as versatile with his artistic ability (singing, acting, playing instruments) as his father David Smith of the Baltic Road is at carpentry work. Pierce’s Mom, Mary Lynn, recognized Pierce’s talent early and has encouraged him throughout his school years to pursue his interests in music and theatre. Our guess is that Pierce Smith will be well-known in theatre. He’s multitalented; hard working and has a positive attitude. Congratulations to the entire acting, music and production crew of Footloose -Bluefield High style.